If you’re not able to get out and ride trails or go on little adventures regularly with your horse, you may find yourself getting bored with riding in an arena. When this happens, it’s wise to keep in mind that the way to change your experience is to change your approach. In this article, we share 15 smart tips to help you have more fun while working with your horse in an arena. Read on to learn more. 1.12 12. Wear a costume! If you’re working towards goals with your horse when you work in an arena, it’s a good idea to use the easy/hard training method to make your training more effective. This involves working on a difficult and challenging task for a few minutes and then taking a mini break by doing something fun. Here are 15 activities (both hard and easy) you can use to do just that! Pick out a particular fence post or mark a place on the wall in the arena and practice stopping exactly even with it. Begin by practicing at a walk and gradually work into stopping “on a dime” from a trot or canter. Some horses have habits such as tossing their heads or stopping and then restarting when transitioning from one gait to another. Identify any little quirks your horse may have and focus on working through them by gently encouraging your horse when transitioning. This small effort will pay off when you are out riding in the real world. 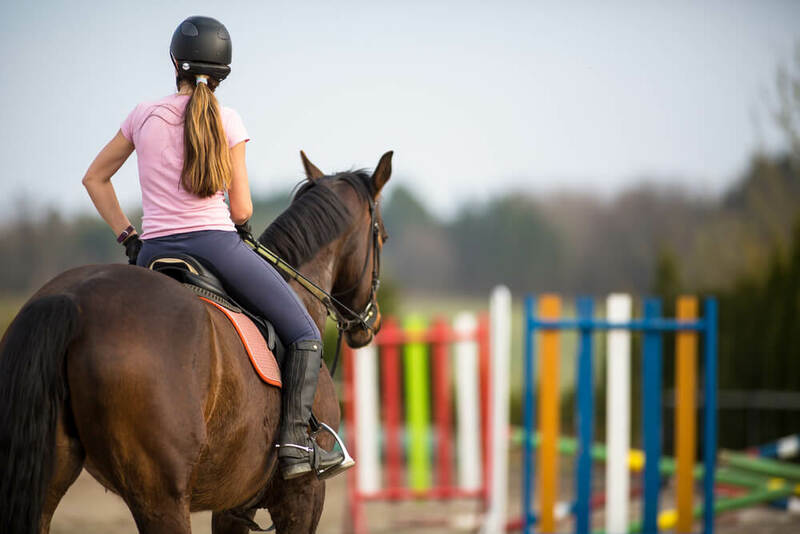 An arena is a safe and predictable place to ride, but you can add spark and challenges to help your horse learn to respond appropriately to unusual circumstances. Introduce unusual objects (e.g. tarps, blankets hanging over fences, a fan blowing ribbons, etc.) and help your horse learn to approach them without panic. When doing this, stay calm and confident yourself and always use the same words. In this way, if you do encounter something unusual on the trail you can immediately use your calming words to reassure your horse effectively. Use soft, harmless, durable “toys” such as a foam noodle or a large foam ball to run relays with friends, joust, knock objects off of posts, etc. Make up games to help hone your skills at performing tasks while in the saddle. Using a safe, unbreakable object such as a water bottle or foam ball try picking up the object from a barrel or fence post as you ride past and then replacing it as you ride past again. Ride while carrying a fly whisk and move it all around as you ride. Touch the horse’s head, neck and body randomly while riding. All the while, talk to him and assure him using your calming words. This exercise may prove helpful to you if you’re riding in an area where gnats are flies are a problem or where you need to write through brush and limbs. Many horses tend to walk off while you’re mounting up. Use your work time in the arena to teach your horse to stand while you’re mounting and not to move off until you’re ready. You can signal that you are ready to move out with a gentle nudge of the heels or with the classic “Walk on!” command. Invest in some cones to set up a series of different patterns that you can ride to work on reining and maneuvering in tight places. Use foam noodles to create mazes or build small obstacles for your horse to step over. Your ideal when riding should be for no one but you and your horse to know what you want your horse to do next. If you’re currently riding two-handed and using direct reining, begin consciously introducing leg signals, seat shifting and quiet voice commands to teach your horse to respond without visible signals from you. As your horse begins responding to your new signals, gradually fade your reining signals. As your horse becomes more reliably responsive to leg and seat signals, transition add one-handed neck reining and then freestyle reining. If you ever been to a horse show, you have probably noticed that if music is playing many of the horses will naturally move in time to it. Horses tend to like jaunty music with a clear beat. If your horse really enjoys music, you may be able to teach him a little dance routine! It’s a sure bet that one of the biggest challenges in choreographing a freestyle reining routine like the one in the video above involves getting the horse used to being ridden with a long flowing costume and having part of that costume slide off during the performance. If you aspire to do a performance piece like this with your horse, take some time to get him or her used to seeing you and being ridden in a variety of different, unusual (safe) clothing. Simple songs such as hymns and old-fashioned folk songs are easy to remember and add an element of fun while riding. Additionally, if your horse tends to be anxious you can adopt a specific song to sing to them whenever anything stressful is going on. This can be amazingly helpful. 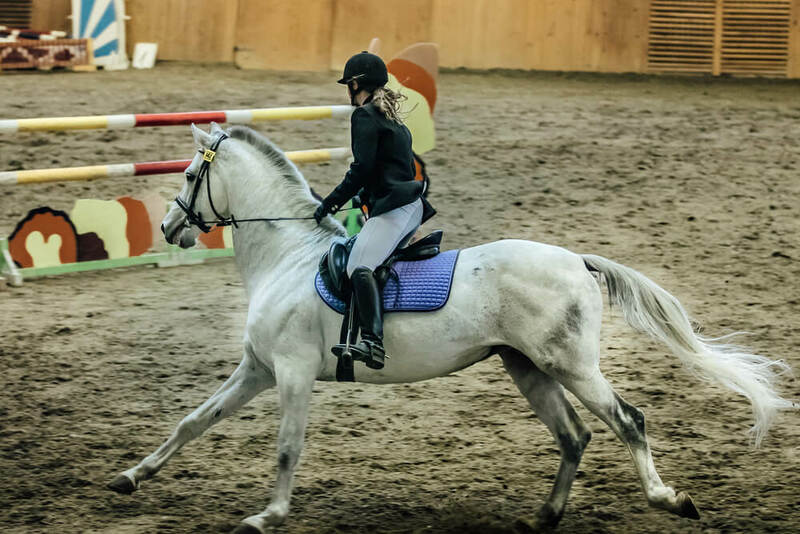 Riding in an arena provides you with a safe space where you can give your horse his head somewhat and focus on your own posture and ability to move with your horse. Relax and pay attention to your horse’s gait and rhythm and allow your body to move with him. This exercise will help you develop a natural, graceful, safe seat that will keep you in the saddle even in challenging circumstances. Think of old-fashioned games that children play, such as follow-the-leader and play those with a friend on horseback. Be careful to always maintain a safe distance so that nobody gets kicked.